White Chocolate Bunny Ears: The Ting Tings. We Started Nothing (2008). 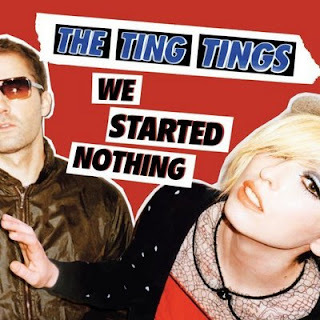 The Ting Tings. We Started Nothing (2008). The cute boy/girl duo of Jules and Katie aspire to mindless silliness, and they certainly achieve that, however they can't hide their creative musicianship. One gets the impression they could actually play prog rock if they wanted to, but thank goodness have chosen instead to deal in bratty Indiepop. The opening track, Great DJ, bounces along amiably, flirting with an augmented I chord along the way, until the chorus kicks in with a modulation to the parallel minor, and you suddenly know The Ting Tings are into something very special. They flopped as a full band previously known as Dear Eskimo. Disenchanted with the music industry, Jules and Katie made music for fun, and were surprised by their new success from just doing what they love. Steve Jobs plucked them from obscurity for an iPod commercial, and we all heard how good they were (licensing is the new radio). They're at that exciting point in their career where they will still play a little club in upstate NY (Valentine's in Albany, to be specific), a record store appearance in Missouri, then have a spot on the freak show otherwise known as the VMA awards on MTV (for the most part preempted by a commercial interruption, unfortunately). They make enough noise as a just a duo, and in live performances play guitar and drums with a flexible setup of electronics to allow for some improvisation. The whole album is cohesive and concise at 37 minutes. The last track seems to drag, but would probably be effective at a live gig. Each track has some nice details you may only notice with headphones, so it's worth a close listen. Traffic Light would fit beautifully on an album of music for children. Katie can sing, but often exclaims in a sing-songy chant like a demented cheerleader, or a more spastic George Pringle. Do we really care that Shut Up And Let Me Go, and We Walk are built on practically the identical rhythm? No, we don't.